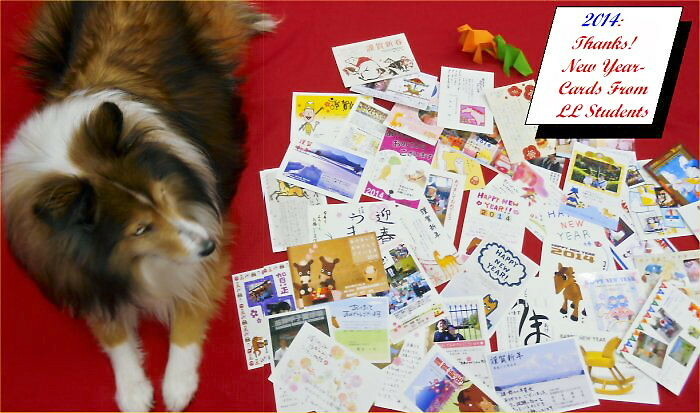 Yoshy has now received 150 and over New Year Cards from LL present students and graduates. As of course, these are all private letters, the part of Cards had shaded off. another part of Erie is not done. These are very special cards; every card includes “his/her warm-heart” a little different from courtesy one. They let me feel that I am very happy to have continued “this LL work” so long time. Thank you! Thank you! Thank you! “Every LL Graduate” wrote “Congratulations on the 40th Anniversary!” + e.g. “We’ve got married.”, “This is our first grandchild/ child.” or “I will walk on my own way.”, etc, etc. All LL past students who were infected by Yoshy’s way of thinking … actually some of them, however, I wish all of you would be happy in your life! Thanks to YOU, I am still now in active every day. Thank you! Thank you! Thank you! Yoshy is looking forward to see you at New Year’s Lesson of M-PEC.